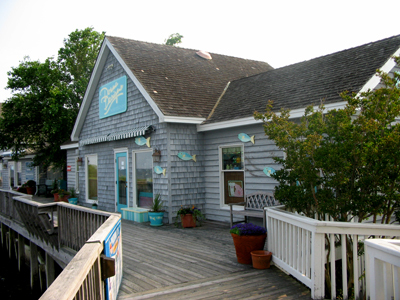 Follow the ramp to the boardwalk overlooking the Currituck Sound, and you’ll find yourself at the front door of Donna Designs. 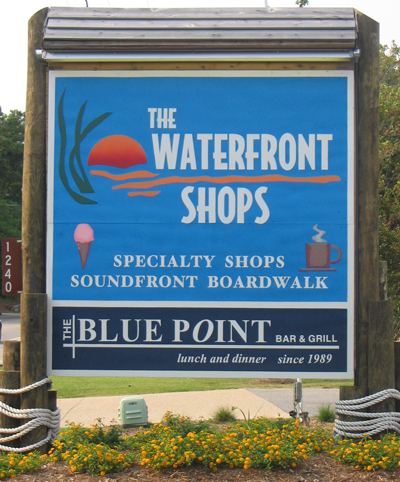 Beautiful sunsets, waterfowl and fish can be seen daily and have been bringing visitors to the Waterfront Shops since Donna opened her store there in 1987. Once inside, you’ll be surrounded by color. Baby onesies and ladies fashion tees are transformed into wearable art when Donna adds her colors. Remember the designs are “One of a Kind, One at a Time” and you’ll find a small design on the back with Donna’s signature. You may see Stephanie, Lee or Bonnie, who will greet you with a smile. They can work wonders combining colors and styles for that special look. It’s fun to mix and match Donna’s tops with some of the other clothing lines we offer, such as Jag Jeans, Nomadic Traders and Eucalyptus. Emerge from the dressing room and start to accessorize. Our hats are great for the beach and we have several lines of beach bags and purses, including some gorgeous handcrafted bags from Erda. We love to accessorize, especially when it comes to jewelry! We are constantly searching for new unique jewelry lines. When we find something we like, we get excited and we stick with it. Choose from Holly Yashi, sterling silver with seashells , Sea Glass by K-Bay , Lovell Designs by Ken Kantro and some spectacular butterfly wing jewelry. 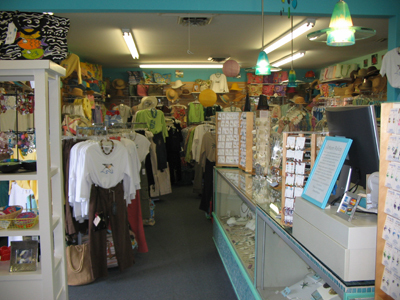 Our latest addition is Outer Banks Girl Friends, which is local group of women that do an array of dazzling jewelry! This is just a taste of what we carry for the ladies. New items arrive weekly and you never know when Donna may pop in with a new design. In addition to Donna’s hand painted baby onesies, bibs and tees, we’re packed with stuff for kids. We have a large selection of Stephen Joseph tees and gifts, including brightly colored backpacks, frames and clocks. Baby tutus and wands in bright colors as well as pastels are in abundance in the kids section, as well as soft stuffed animals, wooden toys and puzzles. We tuck treasures and an ever changing selection of gifts into any bare corner left. So when you stop by, spend some time taking it all in. 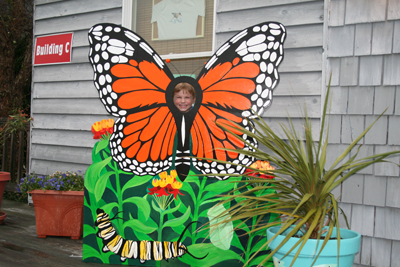 Come to the shop and take a photo of your favorite butterfly!